Circuits are a great way to train athletes. Circuits are a scripted set of exercises combined into a unit of sports training designed with a specific purpose in mind. Because circuits typically involve a wide variety of exercises, tissues are not subjected to the same type of stress. Since many injuries are the result of repetitive action, properly designed circuit training can significantly reduce the risk of injury. 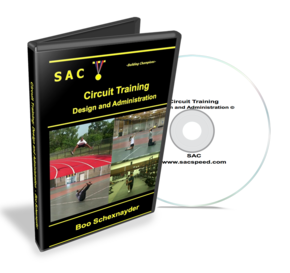 In the video clip below Boo Schexnayder provides an overview of what can be accomplished with properly designed circuit training. He also discusses 7 different types of circuits and explains the characteristics of a well designed circuit training program. Coach Schexnayder has 14 years of coaching and consulting experience, but is most noted for the 12 years he spent as a member of the Track and Field coaching staff at LSU. He has coached 10 Olympians, and has served on coaching staffs for Team USA to the 2003 Pan Am Games in Santo Domingo, the 2006 World Junior Championships in Beijing. He currently serves as the Chair of Advisory Board of the USTFCCCA Track and Field Academy, and directs its programs. Over the past decade, many high school athletes have chosen to play just one sport. By focusing on one activity year-round, they believe it will help them excel in that one sport. And there are more and more opportunities to participate in almost every sport during the off-season. But most recently, many coaches are speaking out against that trend. We’ve come to realize that sport-specificity often hinders an athlete from fully developing and can lead to more injuries. It also limits student-athletes’ opportunities for learning and being exposed to different situations. In response, many sport and strength coaches are encouraging students to become multi-sport athletes. Like a generation ago, we want to see our football quarterback on the mound in the spring, our soccer forward sprinting on the track team, and our middle hitter in volleyball grabbing rebounds on the basketball court. But how does this affect their work in the weightroom? 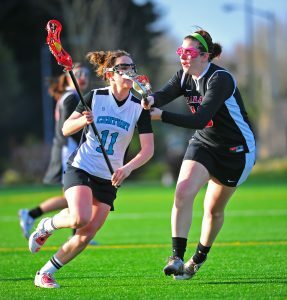 If they are playing on the high school lacrosse team while also suiting up for a club soccer squad in the spring, will a strenuous lifting program wear them out? Talk it through: When training a multi-sport athlete, the main concern is to figure out the demands on the particular athlete—both the demands of the sport they’re currently in and any stressors outside of it. Today’s generation of kids are running from school, to practice, to training sessions, so it’s really important to gauge all the athlete is involved in. Therefore, my initial step is to talk to the athlete and ask him or her to tell me all that they’re doing. For example, I’ve had instances where kids who are in football season are playing baseball on the weekends, and that will change my approach to training them. Before I devise any lifting plans, I make sure I completely understand the scope of all the different stresses that the multi-sport athlete is under. Reduce the Workload: After communicating with the athlete and learning what they’re involved in, I come up with a plan to modify their in-season training. The main alteration is usually a reduction of their training. This entails volume reduction, either by sets or reps, and lowering the intensity. We still ask the athlete to work hard and do some heavy lifting, but we’re smart about how we do that by maintaining low volume. I may also alter specific exercises a bit depending on the sport and position. For example, when training a catcher, I might limit the depth of a squat to reduce stress on the knees. Train Opposites: Another thing to consider doing with in-season athletes is training opposites. For example, if they do a lot of rotation in their sport, I may plan anti-rotation exercises. We’re not going to take a baseball player who’s rotating all the time as a pitcher and do a bunch of medicine ball rotation throws with him—we’re going to do the opposite. And we do the same thing with movement training. If we have a soccer player who’s doing a ton of changing direction during his season, then we may have her do linear sprint mechanics. Simplify: It can also help to simplify the exercises for multi-sport athletes. If they are going back and forth between two different sports, their brain and muscle memory have a lot to take in. I might adjust a lift for them so it is very straightforward and does not require learning anything new. At the same time, it’s important that the athlete is working alongside his or her teammates and part of the group. Encourage them: Playing multiple sports is hard to accomplish successfully. So I make sure I cheer on our athletes who do both. I encourage them when they seem overwhelmed and I let them know their success is important to me. I also make sure to tell them all the benefits. A big one is injury reduction. In my time at BGA, I can’t recall a three-sport athlete who’s had a catastrophic injury. Kids are going to get bumps and bruises, but when we have an athlete who tears an ACL, 90 percent of the time it’s a one-sport athlete because they’re doing the same activity year round. Kids who play multiple sports are also likely to be more holistic athletes. They learn how to be better teammates and they fuel that competitive fire year round. Also, all coaching staffs are different and have something to offer. A young person learns by being exposed to different teaching methods. Fred Eaves, EdS, MEd, CSCS, RSCC, IYCA, USAW, USATF, BIOFORCE Conditioning Coach Certified, is Director of Wellness and Athletic Performance at Battle Ground Academy in Franklin, Tenn. He was honored in 2015 by the National Strength and Conditioning Association as its High School Strength and Conditioning Coach of the Year and in 2013 as the Samson Equipment and American Football Monthly Central Region High School Strength and Conditioning Coach of the Year. When Jeff Decker, MEd, CSCS, served as Strength and Conditioning Coach at Mountain Pointe High School in Phoenix, he developed a unique summer program with sports conditioning specialist Tim McClellan, author of the book Inner Strength Inner Peace as well as other books and videos, in 2009 to help turn around a football team that had a 2-8 record the previous season. The program, called a “Strength and Conditioning Camp,” was a major part of new football coach Norris Vaughan’s rebuilding philosophy involved a renewed emphasis on strength and conditioning. The program was constructed all athletes at the school and not just the football players. The first step in building a successful summer program was getting the school’s sport coaches on board with the new vision. Decker and McClellan spent hours in intensive brainstorming sessions with the members of several sports’ coaching staffs, and feedback from these sessions was key to making the summer program as beneficial as possible for all types of athletes. They also relied on the sport coaches to convince athletes to buy into summer workouts. The coaches communicated their expectations to their teams before the end of the school year, and stressed the importance of personal accountability during a time when many high school students choose to take it easy. Another early step was consulting with MPHS Team Physician Rodger McCoy, MD, who had experience working with high-profile teams and programs including the Arizona Diamondbacks and Arizona State University. His knowledge of recent trends in injury prevention proved to be an invaluable resource to the program. For example, Dr. McCoy told Decker and McClellan they would decrease the athletes’ injury risk if the summer program stressed lower-body multi-planar exercises, such as diagonal lunges and multi-planar single-leg Romanian deadlifts. He also provided advice on advanced rehab protocols for individual athletes who were struggling with injuries, and recommended some specific strengthening exercises for high-priority areas, such as the glutes and vastus medialis obliques (VMO). Having input from a trusted medical professional was a key step in making Mountain Pointe’s strength camp a success. Many high school summer training programs have an “open gym” atmosphere–everyone doing their own thing, with little coordination or forethought. Decker and McClellan wanted to create a much different experience for our athletes. Working together with sport coaches, they formulated seven specific objectives around which the camp would be built. Injury prevention: There are countless exercises and workout philosophies that promise injury prevention benefits, some more credibly than others. Decker and McClellan decided to identify a few specific areas in which high school athletes are most vulnerable to injury and dedicate time in each session to addressing them. For example, to prevent shoulder injuries, particularly those involving the rotator cuff, each day’s workout contained external rotation and scapular stabilization and mobilization work. Decker and McClellan used shoulder external rotations, Kelso rows with isometric shrug holding on an incline bench, and inverted rows using suspension straps. To help prevent back injuries, Mountain Pointe’s athletes performed innovative Swiss ball and Bosu ball exercises for spinal stabilization. Some of our favorites were single-arm chest pressing using a rotational component, push-ups on a Bosu ball, and push-ups using Swiss balls under the hands and feet. One of the most dreaded injuries among high school athletes is an ACL tear. To help protect this important ligament and strengthen the surrounding musculature, Decker and McClellan used exercises such as single-leg Romanian deadlifts, Nordic leg curls, glute/ham raises, and rotational lunges in different planes. For hip mobility and balance development, the athletes did rotational touches using 10-pound weights and RDLs on an unstable surface, such as a Dyna Disc or an Airex pad. To teach landing in an athletic and ACL-safe position, which is especially important for female athletes, Decker and McClellan employed low box depth jumps with a static hold in the landing position. Rehabilitation: For athletes who were recovering from injuries, Decker and McClellan took a highly individualized approach in designing their workout regimens. When necessary, they consulted their personal physician or physical therapist, along with the school’s athletic training staff, to determine the best possible systematic progression. Rehabbing athletes are often very eager to dive back into normal training habits, particularly when working alongside healthy teammates, so it’s essential to structure their workouts to gradually increase the difficulty and account for any limitations they may have. Lean body mass: Decker and McClellan wanted camp participants to get the boost in confidence that comes from visible muscle growth, so part of our strength training protocol involved bodybuilding exercises. But Decker and McClellan wanted hypertrophy that was much more than aesthetic—it needed to be as functional as possible, so it would translate into sport-specific force production when the athletes began their team seasons. To achieve both those goals, Decker and McClellan placed a great emphasis on multi-joint, total-body strength and power exercises. They relied heavily on staples such as squats, bench presses, and deadlifts. Hang cleans and power shrugs were used to promote triple extension and explosiveness, and the push press was incorporated to develop upper-body and vertical explosiveness. Power: Strength has limited value if it’s not accompanied by explosive power, so Decker and McClellan incorporated a variety of horizontal and vertical plyometric exercises in different planes. These included lateral hops with resistance and assistance cords, box jumps at differing heights, lateral and single-leg hops over agility bags, slide board exercises, and progression hops using a rope at varying heights. They also prioritized explosive lifts such as cleans, high pulls, power shrugs, and dumbbell squat jumps. These are excellent choices for increasing the rate of force production, which translates directly into improved performance in most sports. Functional movement: While the major focus of our summer training was to build a foundation of strength, power, and fitness that athletes could further develop as their sport seasons approached, Decker and McClellan also included some sport-specific functional activities. Using resisted cord drills, assisted cord movements, slideboard work, and multi-planar movements, they attempted to mimic the joint angles, rotations, accelerations, decelerations, and other demands inherent in each athlete’s sport. Mental training: An overall philosophy of challenging athletes to meet higher and higher expectations governed all camp activities. 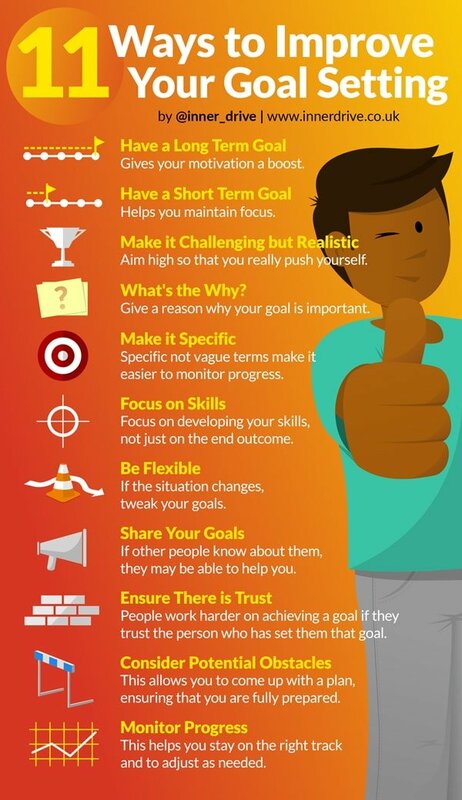 The coaches and strength personnel reinforced this message on a daily basis, establishing a set of guidelines for action and effort in each task and using different motivational strategies to reach individual athletes when necessary. Cutting corners was never allowed—Decker and McClellan required the athletes to start all drills fully behind the starting lines and to finish past (not at) the finish lines. Rewards were given to the winners of competitive drills, which helped instill a “competitor’s heart” in our camp participants. Fun: While our goals were serious, Decker and McClellan also wanted the athletes to enjoy themselves at our strength camp—this was, after all, their summer vacation. They scheduled many team-building drills, from competitive relay races to various forms of tag and other games. Activities like these are great motivators—especially when there are rewards for winning and consequences for losing. Winners received things like first dibs on getting water, which is more valuable than gold on an Arizona summer day. None of the consequences for losers were severe—they’d do a few push-ups or extra reps of an exercise–but high school athletes almost always work harder when something is “on the line.” Plus, simple games like tag help develop important skills such as fast change of direction and reactive quickness in pursuit. Before the first athlete set foot in our facility for the start of camp, Decker and McClellan had hammered out everything from the number of days per week each sport would train to the time each team would commit per workout. Attention to a few specific details helped us make sure the camp would be memorable for everyone involved. They solicited the manager of a local nutritional supplement company and he offered to support the program by providing T-shirts for all the participants–his logo appeared on the back, and we designed a camp logo for the front. This allowed us to provide a nice perk for the athletes and a way they could proudly show off what they did over the summer, without adding any cost to the program. In addition, through various connections Decker and McClellan reached out to a few pro athletes living in the area and enticed them to train at the facility and help out with coaching and motivational talks. Even if you don’t have access to pro athletes, special guests are a great way to add extra benefits to a summer strength camp. Decker and McClellan also invited Phoenix Police Sergeant Jim Cope, who also happens to be a former junior world champion power lifter and world record holder in the deadlift, to speak to the athletes about commitment, teamwork, selflessness, and character. The athletes were highly receptive and clearly inspired—Decker and McClellan could see a difference in their workout motivation after the talk. As another added touch, to supplement the education athletes received at the camp itself, Decker and McClellan organized an evening presentation covering basic sports nutrition. It was open to all students at the school, and because nutrition is an important topic for parents to understand, they were invited as well. They charged two dollars for admission, and donated the proceeds to the school’s general athletic fund.